Growing up my Aunt had a spectacular garden in Wallingford Connecticut. I marveled that her rhubarb plants grew as tall as me (even as a teenager)! She used to have me over in springtime when the rhubarb stalks were ready to make strawberry rhubarb pie. Warm from the oven topped with a little fresh whipped cream, strawberry rhubarb pie is my favorite dessert of all time. IMHO—there is nothing better than this particular combination of tart-sweet and savory. It's always been my choice for a last meal. 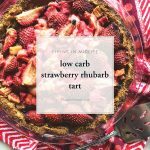 This is my rendition of a low carb strawberry rhubarb pie. It's made with an easy press-in almond flour crust that takes just 5 minutes to prep and put into the oven to prebake. I omitted the top crust to save on carb count; so it's actually more like a tart. Sometimes when strawberries cook down, they release so much liquid that this soup and become soupy. To avoid that, I cook my filling separately, so I can pour off the extra liquid. Everything is assembled after cooking and reheated to avoid that issue. Whisk together the almond flour, salt, and Swerve in a medium-sized bowl, and then pour the melted butter over, mixing with a spatula until well-combined. The mixture should be crumbly but stick together when squeezed. Press the mixture into a 9" glass pie dish, pressing evenly with the bottom of a measuring cup and up the sides of the pie dish. Prick the pie crust all over with the tines of a fork. Bake in the oven for 20 minutes, or until golden brown. In a medium-sized bowl, whisk together the Swerve with the guar gum. Add the rhubarb & the strawberries and mix well with a spatula. Grease an 8" gratin dish or oval baking dish with 1/2 the melted butter & the pour the fruit in. Add fruit to the oven & bake for about 20 minutes, stirring occasionally. After 20 minutes, stir the filling and pour off the liquid if it's looking too soupy. Return to the oven for an additional 15-20 minutes, or until the filling is cooked down. Remove from oven. Again, pour off some of the juice if the filling is too liquid. Add the hot filling to the cooked pie crust. Brush the top of the filling with the melted butter & then return to the oven to warm through—about 10 minutes. Remove from the oven and allow to cool for 10 minutes before cutting. Serve warm with vanilla ice cream or fresh whipped cream. Please note that Erythritol is essentially a carb-free and calorie-free food, even though carbs are listed on the label. 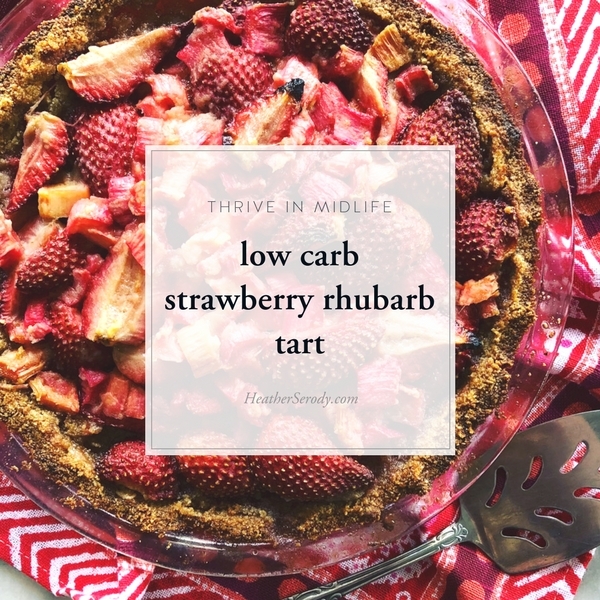 To learn why I do not count the carbs in my nutrition facts, (and neither should you) read up on Swerve by clicking here. Click here to read about why I recommend shopping at Thrive Maret.